The components of the inner triplet, as they appeared when assembled for the first time in a surface building at CERN, in April 2005. 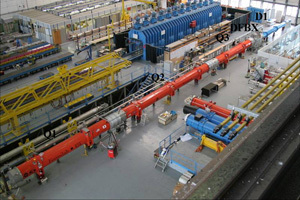 The assembly contains, from left to right, three quadrupole magnets (Q1, Q2, Q3), a cryogenic and power distribution box (DFBX), and a separation dipole magnet (D1). On Tuesday, March 27, structural supports to a Fermilab-built quadrupole magnet, one of an "inner triplet" of three focusing magnets, failed a high-pressure test in the tunnel of the LHC accelerator under construction at CERN. The force generated in the pressure test broke the supports in magnet Q1 that hold the magnet's cold mass in place inside the cryostat, the magnet's outer metal jacket. The support structure broke because it was not designed to withstand the amount of longitudinal force applied during the pressure test. Since March, teams at CERN and Fermilab have worked closely together to identify the cause of the failure and to identify any other potential problems with U.S.-furnished components. The teams have identified several potential solutions. The teams have also identified damage caused by the same pressure test to the cryogenic and power distribution box, or DFBX, the structure that feeds power and cryogenic fluids to the inner triplet magnets. Minor repairs will be needed to the DFBXs, which were supplied by Lawrence Berkeley National Laboratory. LBNL scientists and engineers have joined the CERN-Fermilab team carrying out the design and implementation of these repairs. A review to be conducted at CERN on April 24 and 25 will examine the selected repair methods to ensure that they will fix the problems. The reviewers will also look at the inner triplet system as a whole, as a second check against any unrecognized problems. Scientists and engineers from Fermilab and LBNL will participate in the review. All of the repair solutions now under consideration for the magnet supports and the DFBX can be carried out without removing the equipment from the LHC tunnel, except for those components that failed the pressure test.. Solving the LHC magnet problem is Fermilab's first priority. The laboratory has pledged to provide whatever engineering and technical support CERN requests. Lawrence Berkeley National Laboratory, Brookhaven National Laboratory and KEK Laboratory in Japan have also offered their help if it is needed. The magnet repair will require supplementing the original support structure with one strong enough to hold the magnets in place when they experience longitudinal forces. The new support structure must also be designed so as to minimize the heat transmitted to the magnets, so that they can maintain their superconducting state at a temperature near absolute zero. Additional reinforcement must also be added to two locations within the piping inside the quadrupole, and to the DFBX. The three superconducting quadrupole magnets and the DFBX that failed the pressure test at Point 5 will be removed to a surface building where they will be inspected and tested. The magnet known to be damaged, Q1, will be repaired. If necessary, the other two magnets in the triplet, Q2 and Q3, will also be repaired. They will be replaced in the tunnel by spare magnets. Modifications must be made to all nine of the Q1 and Q3 magnets (two at each interaction region and plus one spare of each) and to all eight DFBXs. These modifications will be made without removing the components from the tunnel. The need to modify the third magnet of each triplet, Q2, is still being studied. Fermilab and CERN will continue to provide updates on the LHC triplets as more information becomes available. Did magnets explode during the pressure test? No. Nothing exploded. The longitudinal force applied during the test caused a quadrupole magnet to move, stretching the pipe connecting it to the adjoining magnet. The pipe ruptured, making a loud noise and releasing helium gas. No. Safety precautions were followed and no one was injured. Did a mistake in mathematics cause the magnet failure? No. In an engineering oversight, Fermilab magnet designers failed to take into account the strength of longitudinal forces on the magnet in designing the magnet's support structure.